Once you arrive in Cusco, you quickly learn how important the guinea pig is – to our diet. 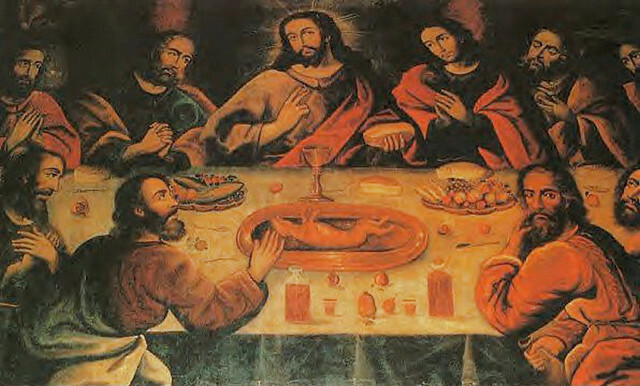 It is such a popular dish in Peru, that the most famous church in the Cusco main square has a painting of the Last Supper where the Apostles are snacking on it. Alpaca Expeditions serves guinea pig while trekking to any traveller interested in trying this delicacy. So far, everyone has loved it – and many have asked how to prepare it. Below are two recipe samples if you are interested in trying it. DIRECTIONS: Prepare the seasoning by combining garlic, pepper, salt and cumin to taste and cover the guinea pig. Leave it to marinate for two hours or more. Then place the guinea pig in the fire (can be grilled or baked). On the other hand, boil the yellow potatoes in water with a little salt and then peel it and cut into slices. Place the potatoes peeled and sliced on the plate and then the cooked meat of the Guinea pig to the Center. Place sauce on top of everthing. SAUCE: In a frying pan, prepare a hot sauce with mashed green peppers and chili panca, mashed garlic cloves and roasted peanuts (previously liquefied or ground) in a little oil, (if it dries too much you can add a bit of water or broth). 1/2 c. oil Pat dry the skin of the guinea pig and rub in the cumin, salt, and pepper. DIRECTIONS: Preheat oil. Dust the carcass with the flour and place it on its back in the oil, turning to cook both sides. Alternately, the guinea pig can be cut and fried in quarters. Serve with boiled potato or boiled manioc root, and a salad of cut tomatoes and slivered onions bathed in lime juice and a bit of salt. Whichever way you choose to prepare your guinea pig – don’t forget to open a nice cold cerveza to wash it down with!